Move your mouse over blue outlined pictures for more fun! He had been darting in and out of clouds all day long trying to keep track of the yellow traveler that had wandered into the Emerald Woods. He was relieved when the creature waddled up the path and toward the playhouse. Mr. Sun knew that Ping Pong & his friends would help him find his way. Ping Pong, Mrs.Bunnywinkle, and Nuber, were startled by an unusual smacking sound. It grew louder and louder and, in an instant, they were face to face with a curious-looking duck. His wings were robin-egg blue. He wore a goofy smile and a necklace made from a piece of grapevine. A rather old-fashioned bluish-green skeleton key hung from it. He had incredibly large, bright-orange feet that surely made the loud smacking sound that they had heard.
" Hell-o there," he said.
" Hi, dandy pandy!" said the duck. "My name is Ping Pong!" insisted the panda. "Well then, ding dong, Ping Pong!" chanted the duck. "You sure are a happy duck," said Mrs. Bunnywinkle. "What’s your name?" asked Nuber. "That figures," whispered Nuber as he gazed down at Slap Happy’s over-sized feet. "Well, my name is Nuber the Hamster, and this is Mrs. Bunnywinkle the queen of the fairies." " I’m trying to find my little friends Chubnut and Gare Bear," said Slap Happy. "I was playing hide-n-seek with them, but I can’t quite nab those two. I hear them giggling from time to time, but when I get close to them, they disappear! I don’t even know where I am anymore." "You are in the Emerald Woods," said Mrs. Bunnywinkle, and we will help you find your friends." Ping Pong interrupted. "It’s getting dark. We should be heading back to Grammas. "She’ll be worried. Those bears will be okay. They are bears, for heaven’s sake! We’ll catch up with them tomorrow." Through the woods they paraded. Slap Happy was merrily trailing behind them smacking his feet on the ground like a drum beating to a march. They would not be able to sneak up on Gramma’s house, that’s for sure! As expected, Gramma opened the door even before they got there. Her furry gray puppy Pete Pudge Pie was right by her side. Gramma was delighted to see everyone. Pete Pudge Pie sniffed them one by one, as Ping Pong introduced Gramma to Mrs. Bunnywinkle and Slap Happy. Then Nuber started to tell Gramma about the playhouse. It wasn’t long before Ping Pong and Mrs. Bunnywinkle jumped into the conversation. All three ran on and on about their day, and they could hardly wait to start working on the inside of the playhouse. Slap Happy was amused by all of the excitement. 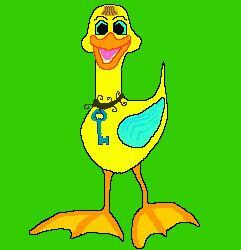 "You guys just quack me up," chuckled Slap Happy. "Maybe I can help you crafty builders with the inside after I catch up with those bears," he quacked. Just then, Gramma caught a good glimpse of the key hanging around Slap Happy’s neck. " That’s an extraordinary key, Slap Happy," said Gramma. "I just found it today," said Slap Happy, as he looked down at his bluish-green treasure. "How’s that?" asked Mrs. Bunnywinkle. " I fell into a creek chasing after Chubnut and Gare Bear, and I saw it sitting by a stone on the bottom. I’d never seen such a neat key before, so I made a necklace for it. It’s already kinda special to me." Gramma continued on, "Oh, then you must take good care of it. When I was young, I had a very special key too. I just lost track of it, and to this day I still can't imagine what happened to it," she said. Gramma started to remember the olden days. "I haven’t thought about that key for ages," she sighed. "My mother gave it to me on my 6th birthday along with a beautifully carved wooden box. The Key was made of shiny brass with the letters " X-O-B-I-A-R" on it, and it opened the magical gift," she continued. Ping Pong broke in with a question. "What’d the "X-O-B-I-A-R" stand for, Gramma?" "It stood for "Kiss (X), Hug (O), Bug In A Rug". My Mother never said "good-bye" or "good-night" to me. She had her own special word. Mother would always say: "ex-oh-by-er." The golden key alone could not open the box. I had to say our special word to open it and to see the magic of the box. "What was the magic of the box?" asked Nuber. "When I opened it and looked inside, I’d see the most colorful and beautiful garden. I’d hear a voice like an angel quietly singing," recalled Gramma as her eyes started to fill with tears. She softly walked over to her cedar chest. She searched deeply and pulled out a neatly folded cream-colored sweater with maroon sleeves. It had the letters XOBIAR embroidered on it. Grammas face shined brightly with a warm, angelic smile. " I had almost forgotten about this." She handed it to Ping Pong. My mother made this for me. I had always meant to give it to you. Gramma handed the sweater to Ping Pong. He carefully took it and immediately slipped it over his head. "Thanks Gramma! It’s a perfect fit," he said. "Like a glove," said Nuber. "What ever happened to the box, Gramma," asked Nuber. "Well, I kept it for a long while. Even though the key was gone, the box was still special to me. One day I gave it to a friend as a gift. Gramma prepared a scrumdillyishus meal and then they began to settle down for the night. After a few minutes of quiet, there was a pitty-pat-thud-thump on the roof of the house. Pete Pudge Pie stood up and pointed toward the ceiling. A few soft giggles could be heard. Pete barked loudly. It became silent again. "It’s those booger bears," said Slap Happy. Ping Pong assured him that they’d catch them in the morning. "Before we go looking for them, we’ll ask The Green King. He’ll tell us how to catch them." "He’s very wise, "said Ping Pong. "Good Luck!" said Slap Happy. "You’ll see," promised Ping Pong. Gramma tucked everyone in again, and as she turned out the light, they all said, "Goodnight!" 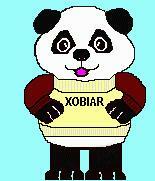 Gramma smiled to herself and quietly whispered back to them, XOBIAR!"